With the labor problem solved, keep your profits secure in our robotic-compatible cooling systems. It was only a matter of time before commercial dairies invested in voluntary milking systems. A lack of consistent labor and standard procedures can be a profit dumpster for extra-large dairies. These dairies are removing threats from the twenty-four seven hustle. XL dairies are hedging on robots, and Mueller has the solution. When your robotic project exceeds 12 boxes everything becomes unique to your facility and layout. At Paul Mueller Company we have an XL Robotic Cooling Solution to handle your expansion. 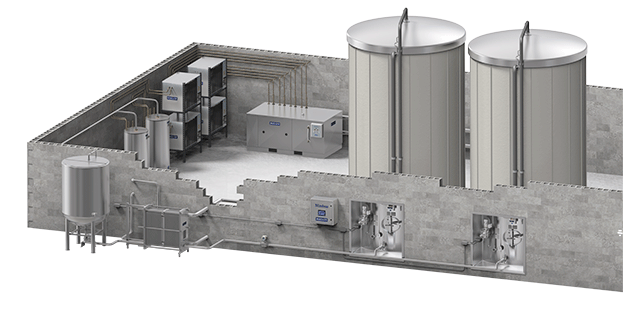 Our design specialists will collaborate with your team to design the ideal system; the milk transfer system, the instant chiller(s)/plate cooler, the on-farm storage vessel, the milk hauler interface, and the clean-in-place (CIP) wash system. The goal is to utilize the most out of every day and every robot. Mueller's milk house solutions help minimize your down time. Two milk house loops help accomplish maximum efficiency. As Dairy Producers think long-term about future growth, you will likely see more robotic dairies worldwide. Robotic dairies allow dairy producers more time for things they are passionate about: herd health, milk quality, genetics, etc. This way of life also promotes flexibility in a dairy producer's daily operations. This also means more quality time with family and friends. At Paul Mueller Company we are here to support your efforts with the most efficient dairy storage and cooling equipment available. When designing a robotic dairy farm request to review the right robotic cooling solution with your local milk cooling representative.